Kitchen Angels is a catering company comprising of seasoned chefs whose backgrounds span more than 20 years of culinary experience from restaurants in the Middle East, US, UK and Europe. Our personal chefs have been handling the kitchen for almost any cuisine. We have the passion for good food and excellent customer service. Kitchen Angels' strength lies in our ability to orchestrate grand events tailored to our clients' taste and budget. We believe in the power of good food. It creates a long-lasting impression on anyone who experiences fine-dining elegance. Thus, it is our mission to provide opportunities where everyone, any family or organisation can carve memories of a special and professionally planned dining experience. Kitchen Angels provide excellent corporate catering services. We have provided hospitality services for LogicaCMG and Central Point, London. We have also managed team building sessions (both with outdoor entertainment or indoor cooking classes) for companies like Vodafone, Accenture, and Quantel in Newbury. 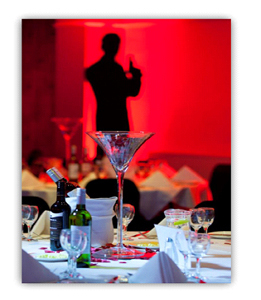 Kitchen-Angels has also organised the Summer Ball of Oxford Post Graduate, Lincoln, Exeter and Christ Church's Colleges. Kitchen Angels' Personal Chefs will guide you every step of the way in the menu design process. They can give you menu proposals considering any special diet requirements or just anything you fancy. You can enjoy a fine dining experience in the comforts of your own home. 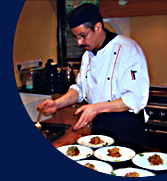 Click here to meet our personal chefs. We'll take care of any catering service you require for any of your special occasions - Baby's Christening, Wedding, Anniversary, Birthday Party, Family Reunion, Summer Picnic or any BBQ or Hog Roast event..and we assure that you and each of your guests will have nothing but a memorably great time. "I have found Hassen and his staff to be punctual, polite and eager to please. He is a perfectionist and acts quickly on any suggestion that may lead to improvement. His Angels are just that, hardworking and extremely helpful." "Thanks for another stellar performance on Tuesday! Bruce and I have come to expect the sublime meals that Hassen creates. He is a true artist. Both Hassen and Tony were diligent and earnest in their determination to produce the perfect evening for us. Our guests remarked not only about the quality of the cuisine, but about the solicitous but unobtrusive service at table by Tony. They are a credit to your firm." "From the first phone call, event planning, accuracy of and sticking to budget, quality of food and service, the bar service and then finally clear up, you have been brilliant and have overdelivered in every aspect. On the night the team were polite, good fun, unobtrusive and really helped the evening be a fantastic success. I would happily very strongly recommend Kitchen Angels to anyone having a party."